Gain expert web-design insight for less with £100 off the first 50 tickets. Following hot on the heels of this year’s successful Generate New York, tickets for Generate London 2018 are now officially on sale. And if you’re quick off the mark you can gain all the expert web design insight and advice on offer at an even better price: we're offering 50 early-bird tickets to the country’s premier web-design event. You can pick up a two-day or three-day pass for £100 off the usual price! Taking place once again at London’s Royal Institution, the home of the Christmas Lectures, from 19-21 September, Generate London is a three-day event packed full of inspiration, education and networking opportunities. 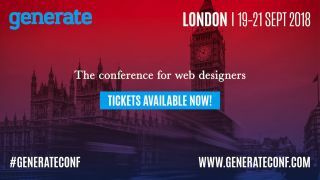 Generate kicks off with a day of workshops, it transitions into two single-track conference days offering talks from world-class web designers. Having cut her teeth working for clients such as Adobe, Ellen Degeneres, Apple, and News International, and picked up Designer of the Year at the 2011 net awards, few people know the world of high-profile web design like Sarah Parmenter. Her keynote at Generate will dive into the subject of quarterly website design reviews with a “design once use everywhere” mantra, plus digging into the ever changing world of Instagram algorithms, Facebook marketing, and topical social media takeaways. 'Shokunin' is a Japanese word often translated as 'artisan’. But the woodwork master craftsman Tasio Odate writes, "such a literal description does not fully express the deeper meaning. The Japanese apprentice is taught that shokunin means not only having technical skills, but also implies an attitude and social consciousness … The shokunin has a social obligation to work his/her best for the general welfare of the people." Following this lead in his keynote, Bruce Lawson, the web standards consultant to Wix and former deputy CTO at Opera, will look at the web standards and the mindset required to be a Shokunin of the web. Marpi Marcinowski is a Polish-born San-Francisco-based digital artist who currently works with Obscura as director of web and experiential design. His artworks are interactive, scalable, and multiplatform, giving anyone ability to shape them, and create their own. His talk will take you on a journey through all interactive media and technologies and how anyone can create their own generative worlds and interact with one another. In Douglas Adams’ novels, Dirk Gently is a "holistic detective" who makes use of "the fundamental interconnectedness of all things" to solve crime. Through a series of stories, Richard Rutter, the co-founder of Clearleft and Fontdeck, will use his talk to show you how to be like Dirk and work out which of a service’s pieces need to fit together, determine how well they meet user needs and rebuild them from the ground up so that they do. Sure we all know about the power of CSS transitions, we use them day in and day out to animate the state of a button or link; but CSS is capable of so much more, especially when paired with SVG and it’s about time we started utilising it. Learn the best tools for the job with front-end designer and developer Steven Roberts in his talk recreating some of the best animations the web has to offer, while discovering the possibilities and limitations of animating with just CSS. With so many great speakers on offer and many more still to be announced, it’s safe to say that the 50 early-bird tickets will sell out fast. So make sure you grab your ticket while they last.